The Unlikely Homeschool: Home Art Studio: Review and Big-ol'-giveaway! 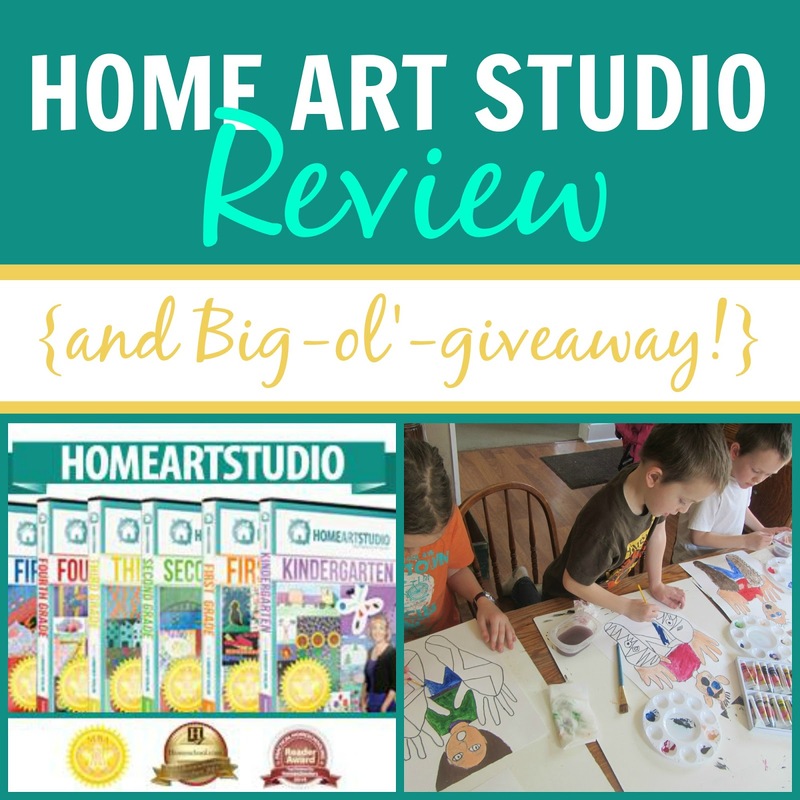 Home Art Studio: Review and Big-ol'-giveaway! It's no secret that I love art time. I mean r-e-a-l-l-y love art time. I love the creative expression. I love the colorful whimsy that it adds to our otherwise black-and-white days. Each week, we all scramble for a fresh white sheet of possibility...for lines, and textures, and color just waiting to be splashed across the page. As always, at the start of the year, I made a very open-ended plan for art which included a free art video from a new-to-me art resource, Home Art Studio. After creating some lovely Georgia o'Keeffe inspired 3-D flower blossoms, we found ourselves searching for more video tutorials from Ms. Volin. A formal art curriculum was not in my original plan for the year. However, sometimes PLAN Bs are a welcome change to the schedule. After the first semester, I made a few tweaks to the schedule and added Home Art Studio to our eclectic mix of art lessons. While we do not do the videos exclusively, they have become a quick art time GO TO. With a wide-range of artists-in-the-making to teach, I chose the Third Grade DVD. I thought it would provide some nice, middle-of-the-road projects that everyone could re-create. And it has! I like to draw. My kids like to draw. But, art should be more than just paper and pencil. Home Art Studio offers a wide-variety of projects that utilize many different art mediums. We've used acrylics, watercolors, colored pencils, chalk, oil pastels, clay, tissue paper...and so much more. In the realm of art, I've always been an advocate for PROCESS over PRODUCT. And while our weekly projects often end up looking very similar to one another's, the focus of each lesson is not necessarily the end product, but the process. Each tutorial gently introduces art terms and techniques that build upon previous lessons. Words like tertiary, analagous, and tint have slowly made their way into our vocabulary. Although key art concepts are discussed, they are naturally peppered throughout the lesson and not over-emphasized. Like famed educator, Charlotte Mason, I think that artist study has definite value. Master artists make great mentors. That being said, I think sometimes homeschool art curriculums can miss the forest for the trees. Too often, lengthy studies of famous artists and their works leave little to no time for a child to create ACTUAL art. I appreciate the balance offered in Home Art Studio. While my children have been introduced to Pablo Picasso and cubism, have learned the difference between modern art and contemporary art, and have been versed in proper art museum etiquette, they have mostly gotten to CREATE ART! Home Art Studio Third Grade is a DVD Rom program that includes both video tutorials and a pdf file containing step-by-step written lesson plans and supply lists for each art project. Art supplies are not included and must be purchased separately. Includes the instructions for 16 art project. 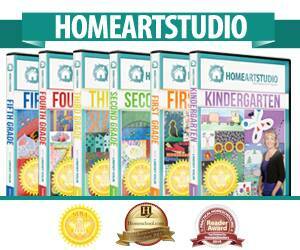 For more information about this or any other Home Art Studio DVD, be sure to visit them on Facebook , Twitter, or Vimeo. Wanna Win the ENTIRE Home Art Studio collection? Now's your chance to grab the entire set of Home Art Studio DVDs. That's all six art videos ranging from kindergarten to fifth grade!! With a retail value of $175, this video series is a complete elementary art course...and one lucky winner will get it all for free!! There are several chances to enter. Just click on the +sign for every entry you wish to make. No purchase necessary to win. Must be 18 years old or older and have a US address to enter. The winners will be randomly selected via Rafflecopter and announced sometime after Tuesday, April 14, 2015. The winners will be notified by email and will have 72 hours to respond. If an email is not provided or the winner does not respond, the prize will be forfeited and a new winner will be randomly selected. This giveaway is in no way associated with Facebook. I was given a copy of Home Art Studio Third Grade and all necessary supplies in exchange for my thorough and honest review. All opinions expressed are completely my own. I am not responsible if your experiences vary. I like the idea of this curriculum because I am no artist. I don't have any skills or know anything about technique. My kids could really benefit from a program like this! I love being able to watch someone actually do it rather than read and guess. A video art lesson sounds appealing to me because it takes some of the prep work out of art. I wouldn't need to come up with an idea, try it out, or make a sample.....I can simply be one of the kids and sit with them and do the art lesson together! This would introduce my children to aspects of art I have never learned about. As a visual learner, the idea of watching someone would make it so much easier to teach my own children. This program looks like so much fun, I have my fingers crossed. This would be amazing to have step by step instruction for my kids! This gives my kids the chance to do projects I would never have thought of, learning techniques and some art history along the way! I like that we can pause it and work at our own pace. By the way, love your blog!!!! I'm truly an addict. That looks really cool. And, we would not do art if we don't have a curriculum scheduled in so this would be great! I love the idea of using a video-based art program, for multiple reasons! My children and I are such visual people, far more interested in seeing things done in action, rather than just in a book! Another reason is my being SO INTO art! I love all things pertaining to art and would love to do everything I see, which can be pretty crazy. Ha! A program so visually simulating, while also being an actual art curriculum would give our creativity purpose and direction without confining our creative spirits. Step by step visual learning makes this so appealing. I would love to try!!! We used the 2nd grade DVD in the past. We had a great time learning new techniques and I loved the way each lesson tied in with folk tales from various parts of the world. My son is a visual-kinetic learner, so watching videos is always a good idea! I am not good at art and this would make it easy to teach my boys, showing them what to do. This look great! Would love this for my son!! This sounds like an awesome program! My son loves art and I can almost draw stick people! Excited about this opportunity! Thanks a bunch! We have used one of the videos this year and loved it . It would be awesome to have the set as an art resource for years to come. My kids have always wanted to learn art, however I'm not really good at it. Everything I've purchased in the past has more or less ended up as "craft" instead of art, so this program really looks interesting to me. I would love to try it with my kids. I am intrigued by this! Looks like something my family would be interested in! I am not an artist by any stretch of the imagination; however, my children love art, and I'm usually at a loss of what to do. This art program would be a fantastic solution to my conundrum! I have two budding artists but I know nothing about art personally. This looks like it would be a great help to build their skills without having to rely on artistically-challenged Mama! Maybe even I could pick up some skills! I love that it has both the video tutorial and the pdf so you can prepare for the lesson. It looks great! I love that it uses a lot of different types of medium. I also love that it appears you can use one grade over a variety of ages. I have a soon to be 6th grader, so this seems very helpful! I like the idea of being able to learn about art with my kids! I like how someone else will teach the art lessons and it is a video format which is perfect for my visual child. I'm not an artist so I love the idea of someone else with some skill teaching my kids art. Definitely need this. My son loves art! I do not enjoy art and do not even know where to start to teach it. I would love not to have to plan out art lessons -- let someone else teach them this subject! And it would be fun to learn right alongside of my kids. I think this would be great for me & the kids! I am not great at teaching art, so the dvd would help greatly. Being able to include art in our schooling would make my kids very happy! So far we just do art once in a while mostly at our homeschool group. Art is one area where I feel we are lacking in our homeschool day. We are very creative and the kiddos have access to crayons and paper but a structured art lesson just doesn't happen. We also haven't found local classes that suit the needs of my family so a DVD program sounds so wonderful! Able to accommodate all my learners at home, what a blessing. Having someone else teaching a lesson to my kids appeals to me. I don't always explain things the way they need them explained and it's good for them to have a new instructor besides just hearing mom's voice all day! I know nothing about art, but I'd like to find someone who does. 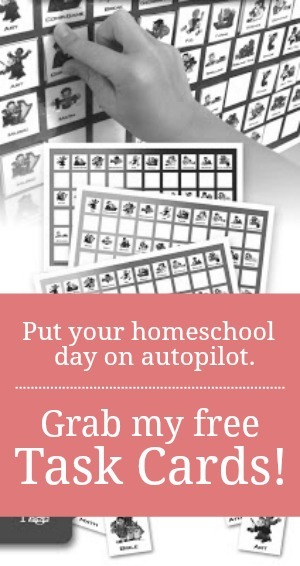 This art curriculm sounds perfect for our homeschool. I'm looking forward to trying this with my kids. I like this idea because we don't do much art right now. My husband is an artist by trade, but he works mostly with pen and ink, so that's what he teaches the kids. It would be great for them to get exposed to other mediums. I bought the 2nd grade dvd for my daughter and ended up using it for our homeschool co-op. The kids loved it and the parents are asking for more. I would love to win this set! I love the video series because my children love art and art projects but I'm not artistically inclined! lol It would help make teaching them art so much easier. I like that its video based. I love art! So I could join in on the projects with my kids! Sounds like a neat art program! I like how the children are able to see the artist in action! I love that an art teacher is teaching them the lesson this makes it so easy! A couple of other moms and I are planning on teaching this art program to our kiddos next year! We love the idea of letting someone else teach for a bit and all the projects look great! This review could not have come at a better time! I decided to add art to our week next year and I was at a loss on how to do it. I don't want something to overwhelming for my littles but I do want them to begin to explore different mediums and techniques. I have also been nervous about teaching something I have no real knowledge of or talent in. These video lessons might be a perfect solution. Definitely gonna take a closer look at this curriculum! I like the idea because my son wants to be a children's book author and illustrator and I always spent most of art class cleaning up whatever I had spilled that day. Having an expert show him the steps would be great! Michelle H.
Our kids never tire of Art.... An experienced DVD program would be great! This appeals to me because while I am an artist in other ways, I am not an artist in the visual arts. I have been looking at Home Art Studio for awhile! I would love to win it! I love that it's video based so my kids can see what they're supposed to do as they do it. They can pause start and stop as they wish. I've had this in my amazon cart for a little while now. We went online and tried the sample lesson at Home Art Studios.com my girls loved it! :) We would love to win a copy!! Thank you for offering the drawing! I am a visual learner and I would enjoy learning how to do art right long with my children. Sounds fun! I'm not very good at art, so this would be a great way for my kids to learn, and it would be one less thing I have to teach! I love art, too... So does my daughter. She loves crafts, painting, pasting, messes, all of the above. A video based art program sounds delightful. I love getting to learn right alongside of our children. I am not confident in art, but my girls love it. It would be great to be able to learn along with them. I like the idea of multiple art media and learning some vocab. My kids would love it! I love that I would have a,set art lesson plan! I am interested in this art video curriculum because of your comment about how it integrates artist studies & techniques with the hands-on opportunity to experiment with the techniques learned about. We seem to struggle to find a balance between the two because I pull from various sources to create our art program and while I try to integrate both aspects of art, we tend to do one or the other more often than I would like to. I think this program would be a refreshing change! Kelly P.
I'd love having a resource that it's all ready to go! I think it would be a great resource for my already creative children. They have not used a video before for art lessons so that would be a new experience. Maybe I could learn something too! It would be so nice to have someone teach the thing that I just don't always manage to get done. What a great giveaway! I like the idea of learning alongside your children and having someone else teach would be a nice diversion from our regular routine. It is also great to be able to rewind or pause to either watch something again or to take our time with the lesson. Thanks for offering such a great gift! I am not creative at all! I have no idea what to do and am very uncomfortable with art. I find it difficult to spend so much on a subject that I don't find as practical. And yet I am in love with the idea of art! I think the videos would be a great way to teach me art, how to embrace creativity, and learn along with the kids. I know that I am sadly lacking in this area and think the videos would be a great tool in teaching all of you. I like that it takes the pressure off of me to be the expert in that topic...because I am not! I really like that it is all ready to go. I don't need to search Pinterest for ideas or search through countless links for the right tutorial. I don't need to know how to do the art myself, I can just pop in the DVD and do art with my kids. My busy days would thank me! Thank you for this opportunity! I have been looking at this. We like art, but I can't come up with things. My daughter likes directions to follow along with so this would be great! I am not good with visual arts and would love to have a resource to cultivate my artsy son blossoming skills. - Nancy Z.
I love the fact that I could also create art with the children instead of trying to teach it to them myself. My kids would love this curriculum! We have the kindergarten DVD and would love the whole set! I love the free lesson we tried! She explained the techniques simply and it was nice to join in with the kiddos. I'm not an artist, so having an artist on the video for my kids to watch is a huge plus! The most appealing aspect of a video is that it reduces the prep time for me! Thanks for offering this giveaway! Quality instruction, fun projects- what's not to love? I've been eying this program for a long time, it looks great! I love this idea as both of my children are special needs and visual is just what they learn best at. This would make our art program really flourish. Oh, what a great giveaway! Mine are visual learners, so they respond well to dvd instruction. We love art in our home, thanks!! My daughter LOVES art but I have ZERO artistic ability myself. Having someone sit right there at the table with us via dvd? Awesome! My 12 year old daughter LOVES drawing and would love to learn more but I can't draw to save my life! This would be a great way for her to learn! Video instructed art set would be amazing since my husband and I have little artistic ability and knowledge. My son is really interested in art so this would really be exciting to him. This curriculum is on my list of wants. QUESTION You also have to click the +5 on the Rafflecopter app after you have commented. How can I be certain I did this? I don't remember seeing it nor do I see it now? It would be great to have some new ideas for art projects as my kids get older. We will be homeschooling next school year. My daughter loves art and is very creative. This kind of DVD art program sounds awesome. I would enjoy creating and learning right alongside my kids! My oldest loves art. This looks awesome! The ease of use is what is most appealing. I would love something to help us get past paper and crayons! My kids LOVE art and this program has been on my wish list for a while. Winning the entire set would be such a huge blessing!! Thanks for the giveaway! I like the idea of video art lessons because I don't know a lot about art and don't do very well at explaining it. An in-home professional art teacher would be superb! I like the idea of video instruction since I don't know much about art. I would love to win this set! Having art taught by someone who knows what they are doing will benefit both me and my girls. Thanks for the give away!